Improve your phone mobility and get a secure mobile messenger. Control your users & activities on your network. Try all your network features for 20 days for free. Setup is done one time for all network users. Connecting your phone system on the web dashboard is simple and straightforward. Have all your network users download Zangi Messenger on their smartphones or other devices. Make Zangi yours. Send invite links to users directly from your web dashboard, asking them to join your network. No set up/configuration is needed. Click and become a network member. All of your connected users will have your company network call button inside Zangi apps. Give it a name from your dashboard settings. Already be able to make and receive calls from your existing local phone system on your messenger. Save on your phone bills. Make and receive calls through your business phone system, even when out of the office. Save even more. Call from abroad and still be directly connected to your system, avoiding roaming charges. All your calls and messages are protected with end-to-end encryption. You will get your own messenger network, where you’ll be able to control your users and activities and analyze statistics. 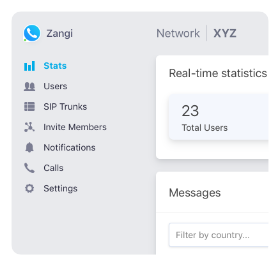 Thanks to Zangi’s advanced architecture, you can make HD outgoing and incoming voice calls via your business SIP phone system. Enjoy a full suite of modern messenger features like group chat, video calls, stickers, file sharing and more. Send message notifications to all your network members on their smartphones. All your users will have a dedicated call button on their apps, with your company name. Use it to make network calls on Zangi apps. It is completely free to try all the features of your own private and independent communication platform for 20 days. What are the advantages of using Zangi over SIP softphones like Bria? Bria and other SIP softphones are just calling apps and dialers, whereas Zangi is a full-featured modern messenger. Are you a SIP Provider? We’ll help you expand your business and give you a competitive edge with added mobility, premium messenger features & security to your services. Start your network today with affordable plans.